A community-based “national champion” is on the cards for South Africa, Mineral Resources Minister Ngoako Ramatlhodi told the 2015 Investing in African Mining Indaba in Cape Town. A community-based “national champion” is on the cards for South Africa. The Ministry of Mineral Resources and the mining industry are in talks aimed at turning “adversity into advantage”, says Mineral Resources Minister Ngoako Ramatlhodi. Officially opening the Investing in African Mining Indaba on 10 February, Ramatlhodi said he was fully apprised of the restructuring plans of some of the major players in the industry. “Our intention is to establish a new South African mineral-based ‘National Champion’,” he said. The body might be either a “single commodity creature or a multi-commodity enterprise”, the minister said. It could also mutate, to carry with it small producers. The underlying principle would be broad-based participation. Speaking after his opening address, Ramatlhodi said the “national champion” would be created from companies that were disposing of their assets. His department was already in discussions with companies such as Billiton and Anglo American. “I am targeting those assets [that they are unloading],” he explained. In his address, the minister said that, given the centrality of mining to the economy of the country, “we are leaving no stone unturned in providing a stable environment for the industry to grow”. Over and above the Mining, Growth, Development and Employment Task Team, the government was reviewing progress made in the attainment of objectives set out in the Mining Charter. “A tripartite team has adopted a template which should enable us to release the results of the review by the end of March 2015.” The department has also set up a special processing team dedicated to processing the data in the template, he said. Ramatlhodi sought to reassure investors that there was policy stability in South Africa, stressing that the Mining and Petroleum Resources Development Amendment Bill had been referred back to Parliament as it might not pass constitutional muster. In the short term, the Bill should be passed as speedily as possible, but in the long term, the government would look to separate oil and gas from the other minerals. Turning to the subject of the energy crisis, the minister agreed that if there was no electricity there could be no mining. In an attempt to tackle the problem, the government had decided both to build up Eskom and to allow independent electricity stations. “We are tackling it on an urgent basis,” he said. With regard to strikes, particularly those that are ongoing or turn violent, as has been the case in the platinum sector, he said “legally binding arbitration” was being discussed as a way forward if the opposing sides cannot agree. 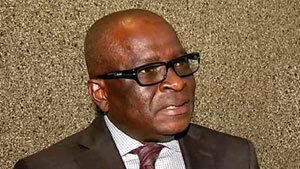 Ramatlhodi called on mining executives to be transparent, bearing in mind that “we’re all facing serious challenges”. “They must be open with labour; they must show their books so everybody can see what is in the kitty. This will give a new perspective to negotiations.